In 1991 the Chartered Institute of Building initiated a multi-institute task force and a Code of Practice for Project Management was published in 1992, with a second edition in 1996. Like previous editions, this third edition has been substantially revised to embody the results of intensive consultation between the CIOB and representatives of the professional bodies concerned with construction and development. the second section contains a project handbook, complete with guidance documentation and checklists. Effective project management involves the assessment and management of risk, and this is a strong theme throughout the Code. 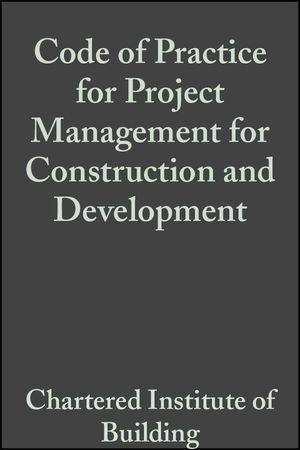 The Code of Practice provides an authoritative guide to the principles and practice of construction project management. It will be a key reference source for clients, contractors and professionals, irrespective of the size and nature of the project. Much of the information is also relevant to project managers in other commercial spheres. "The code is an outstanding example of collaboration between key professional industry bodies working in a team ... it represents a significant step forward ... to help achieve successful outcomes for both clients and the construction industry." "I strongly recommend this valuable multi-institutional code of practice to all who are involved in construction project management and development." The Chartered Institute of Building (CIOB), is a worldwide professional body that represents construction and property professionals who work within the built environment.